Spiritual Sovereignty rectifies and neutralises many taboo topics and allows you to reclaim your authentic self to be a ‘whole-soul’ again. Shamanic Soul Retrieval and Personal Timeline Wellbeing are methods Kay has developed, as very different versions to popularly known techniques, to embrace your shadow self and reconnect with your higher self. Kay will take you journeying to discover your Shamanic Inner Psychic Space and meet your Shaman-Teacher. 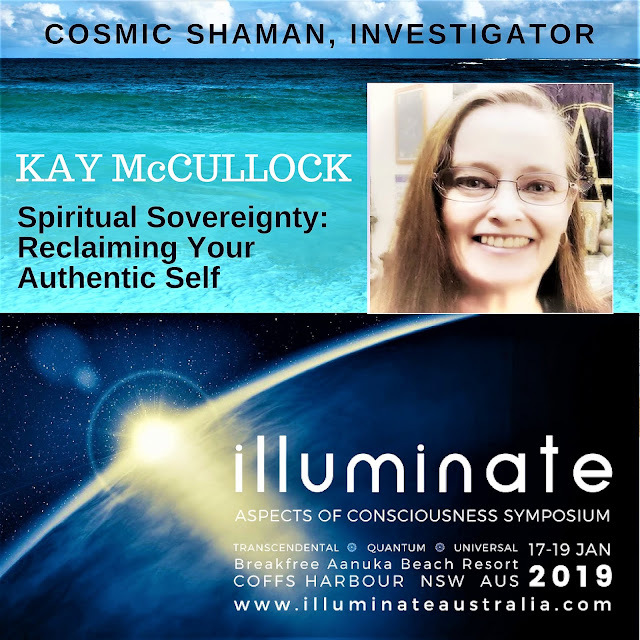 Also known as 'CosmicShaman' (Shaman-Druid Initiated Name), Kay is a professionally trained, qualified and registered Naturopath, VegaTest Practitioner and Wholistic Healer; Scientific Accredited Researcher of I.T.E.M. & Environmental-Energy Medicine; Alchemist, Cosmic and Celtic Shaman, Druidess, Mentor; 4th Generational Contactee and Milab Experiencer; Professionally Trained Investigator & Researcher. Conference Speaker and Workshop Facilitator; Published Columnist / Editor and Blogger; Featured in Media Interviews and Documentaries. Since the late 1990s, Kay has worked with CSETI (USA) Dr Steven M Greer for many years and is a Coordinator for CSETI Australia CE-5 Working Group© and an Ambassador to the Universe (CSETI Advanced Research). Kay facilitates workshops on Consciousness, Cosmic, Metaphysical and Sacredness. Kay will also be presenting a workshop and hosting a skywatch. Please note if you plan to attend the skywatch, Kay's workshop is a pre-requisite. 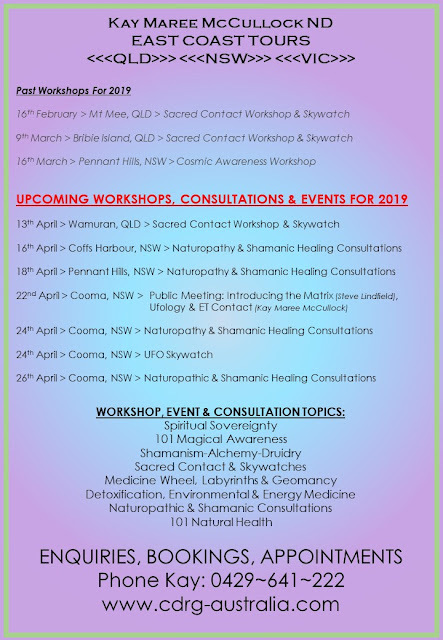 In this experiential workshop and skywatch, Kay will share her lifetime of personal experiences, knowledge and wisdom about ET Contact and Cosmic Awareness, via proven techniques and practical processes, by accessing higher dimensional states of consciousness and spaces - like the Akashic Realm - through Cosmic & Celtic Shamanic-Alchemy Processes and Druidic Journeying, Meditations, Earth Ceremony and Chanting. After the workshop, we will put all of this into practice by participating in a Skywatch. It is a pre-requisite of attending the skywatch to participate in the workshop to maximise the effect of the contact experience. * The Golden Meditation (a technique she has developed over a decade). (Note: These are in addition to the Conference Tickets). See the registration desk at the Conference to purchase your seat. We all look forward to 'Making Contact' With You! !